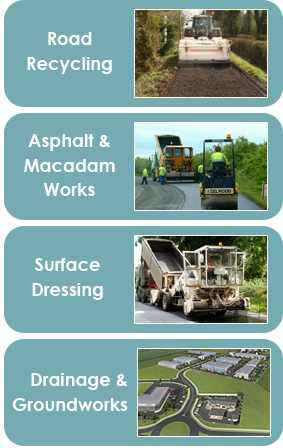 Callington Ltd. offers a range of products to cover any surfacing requirements. We offer a range of traditional and alternative products to ensure that we can offer our clients high quality, durable and cost effective solutions. We are one of the only contractors inÂ Ireland who offers this range of products not only to local authorities, but also to commercial, industrial and domestic customers. Whether you are looking for new road construction or to repair and maintain existing surfaces, we can help. For further information, please contact us and we will be happy to advise you.